Chicago, Il, USA – 9 July, 2012: The Alpari World Match Racing Tour takes to the water (Practice day) on Lake Michigan tomorrow as Chicago Match Cup, the newest event on the world’s premier sailing series, welcomes the sport’s top talents to the fourth stage of the season, running from 10 – 15 July. Amongst the Tour Card Holders looking to challenge for the season’s remaining points are reigning ISAF Match Racing World Champion, Ian Williams (GBR) GAC Pindar and talented young Frenchman Pierre-Antoine Morvan (FRA) Vannes Agglo Sailing Team, both of whom have shown some early season form during the first three Tour events. Morvan competes in the full Tour for the first time in 2012 and sat joint top with Hansen after two events. He is confident that the smaller TOM 28 class keelboats in Chicago and those in upcoming events will suit his team: “We thought that the first three events on the Tour would be hard for us with bigger boats but the next three [Chicago Match Cup, St. Moritz Match Race, Match Race France] should be good. Williams, who currently sits third on the leaderboard and is aiming for a record-equalling fourth Tour title this season, lost out to Hansen in the final of the recent STENA Match Cup Sweden. Asked about his Tour title ambitions, he said,: “We need some good results now to get close to Bjorn [Hansen] but at the moment they’re doing everything they can to make it hard for us. In addition to the world class sailing action which kicks off on Wednesday 11th July, tomorrow will see media take to the water for a Pro-Am fleet race, which will run between the day’s practice sessions. 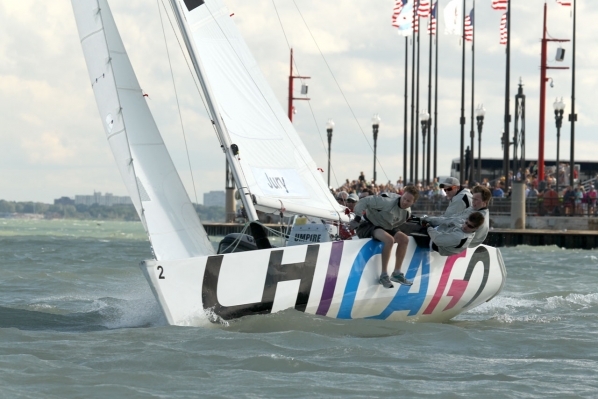 Chicago Match Race Centre (CMRC) will make a $25,000 donation to the Judd Goldman Adaptive Sailing Foundation, a public/private partnership with the Chicago Park District, which provides sailing for the physically disabled and inner city youth. Chicago Match Cup practice sessions start on Tuesday 10th July with Qualifying rounds commencing at 1000 CDT on Wednesday 11th July. The Final is scheduled for 1400 CDT on Sunday 15th July. Additional information and updates are available at www.wmrt.com. ← ReneMarine Proudly announces the release of The Schokker!